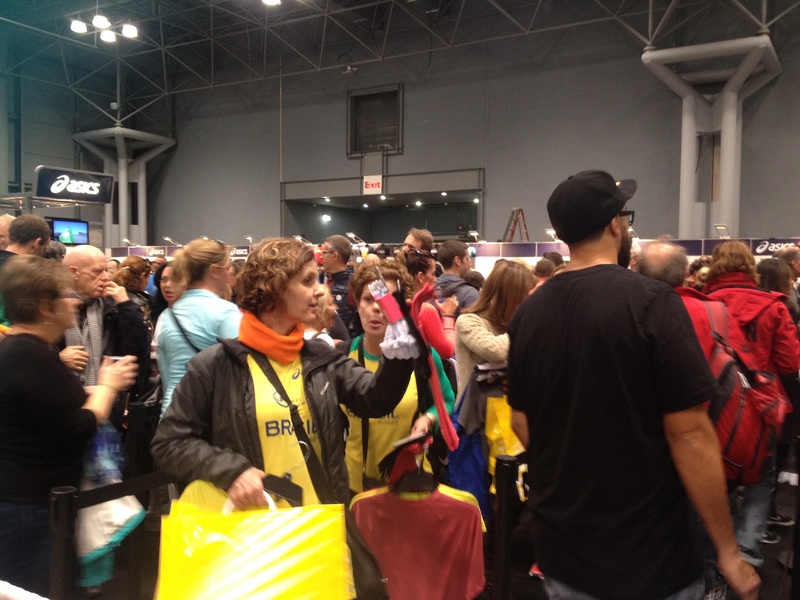 I hit the NYC Marathon expo on its first day, shortly after it opened. My goals were modest – collect my race bib, load up on race swag and free samples, perhaps browse the wares a little, and document the event for you, my readers . . . all while minimizing time on my feet. I made sure to position my three-digit bib number so that others could see it (without being too obvious), while holding myself erect and trying not to trip. His point was well taken. Both the . . . length (and . . . width) were a little skimpy. I asked for a large instead. Shirt and race goodie bag in hand, I passed through bib check (to make sure the embedded timing chip registered my name, as opposed to some random stranger’s) and into the swirling mass of humanity that was the ASICS store. What looked at first like a chaotic mob was, in fact, American retailing doing our country proud: runners from all around the world had draped multiple articles of ASICS clothing over their arms and were standing on line to have their purchases rung up. And then standing on a separate line to get their personalized pace wristbands. 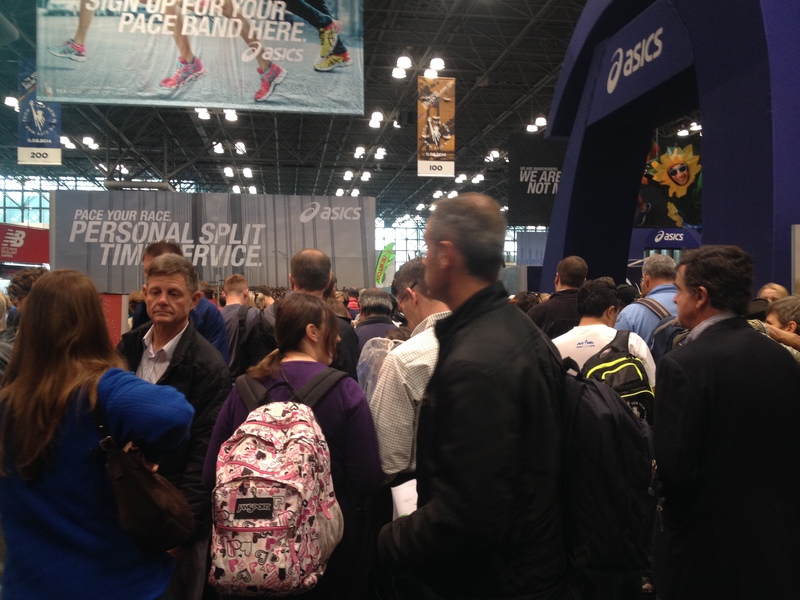 The line for ASICS merchandise . . .
. . . and the line for personalized split time wristbands. Not me. I got out of there as quickly as possible, and then speedwalked through the other (mercifully less crowded) displays, looking for free samples. 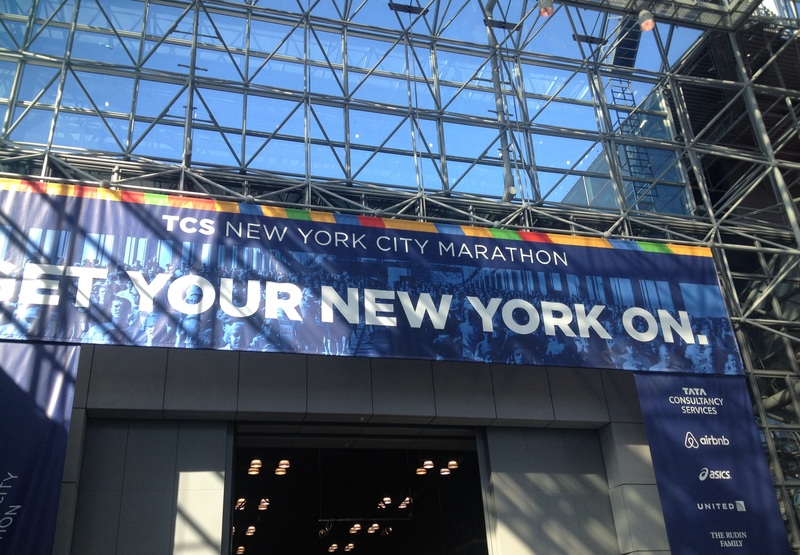 I could have snacked on various energy bars and gummy candies, or done shots of energy gels, but that struck even me – with my love of free stuff – as a Very Bad Idea three days before the marathon. What I really wanted was stuff to take home to put in our stockpile for future hard times (or road trips or long hikes), and that kind of stuff was in short supply. I had to content myself with a single packet of whole grain breakfast biscuits (“golden oat” flavor) that promise to provide “nutritious sustained energy.” I notice that no claims are made for taste. As far as I’m concerned, the highlight of the expo was the Brooks display. I’m partial to their running shoes – just got the new Adrenaline GTS 15’s in eye-catching fuschia and salmon – but what really won me over were their portable changing rooms, done up as port-a-johns. Nice touch, Brooks. It made me smile . . . plus, changing in a port-a-john is good practice for real race conditions. Seriously. – A 12-oz “Go! Size” bottle of Poland Spring water. Sure, whatever. – A fold-out course map from Team for Kids. This one is actually useful; I plan to mark it up with my expected arrival times and give it to Eric for race day. – Temporary tattoos advertising Footlocker and Tata Consultancy Services. No. 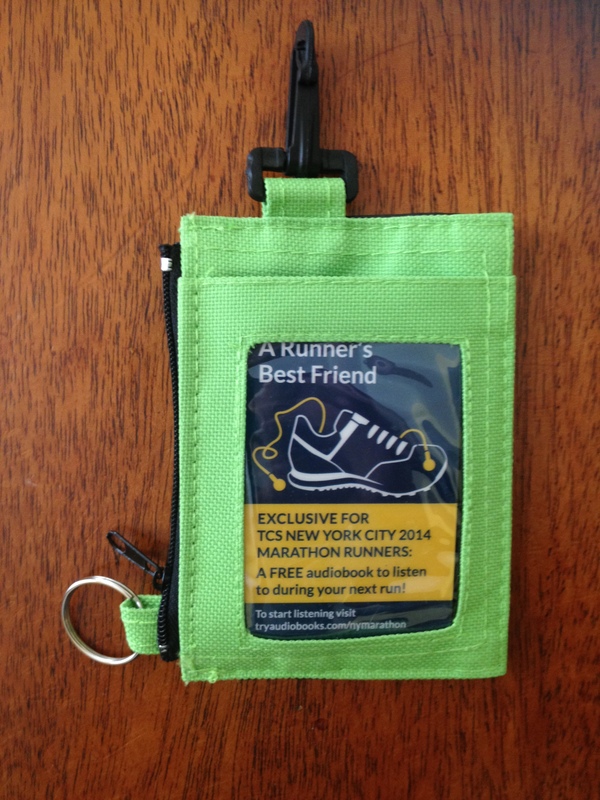 – A pouch asserting that audiobooks are “A Runner’s Best Friend” and offering a free audiobook download “to listen to during your next run,” with some cheap earbuds tucked inside. I don’t understand the pouch. It desperately wants to be useful – it has a couple of credit card-sized slots and a zippered pouch, along with a key ring and a clip-on device – but at 3.5″ x 4.5″, it’s too small to hold an iPhone, and too big to clip to your shoes or shorts. I suppose you could clip it to a fuel belt (if you run with a fuel belt), but don’t most of those already come with little pouches? 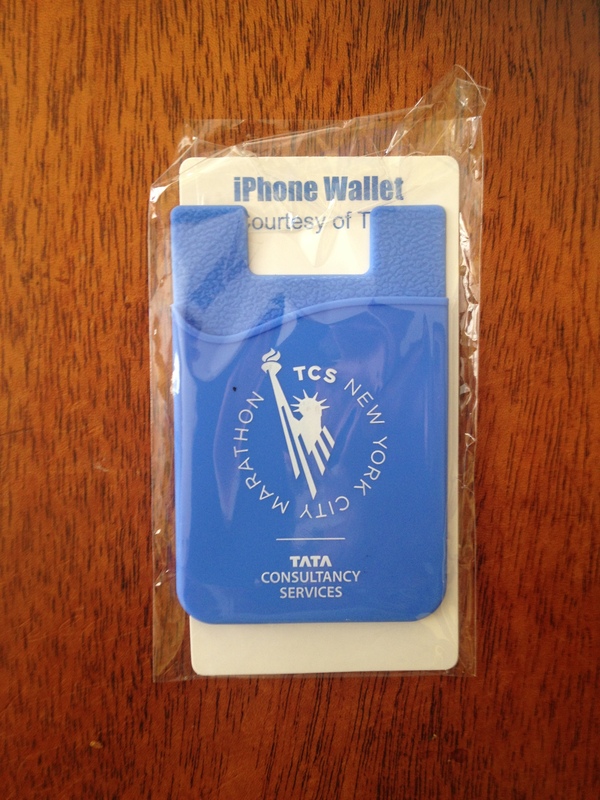 Finally, there’s my personal favorite: the Tata Consultancy Services iPhone Wallet. At roughly 2″ x 3.5″, this is obviously not a wallet in which to carry your iPhone. It’s more like a wallet for your iPhone. The back is covered with some sort of high-tech adhesive, so you can stick it right on there (the little notch assures that the Apple logo will still be visible), and voila! Your iPhone now has a way to carry its ID with it when it goes out on the town. I am, of course, wildly excited about race day. And nervous. I’ve been obsessively checking the weather forecast and hoping the wind isn’t as bad as they say it’s going to be. My clothes are all laid out, with my new bib (#611) on top of them. I’m ready to get this race on. 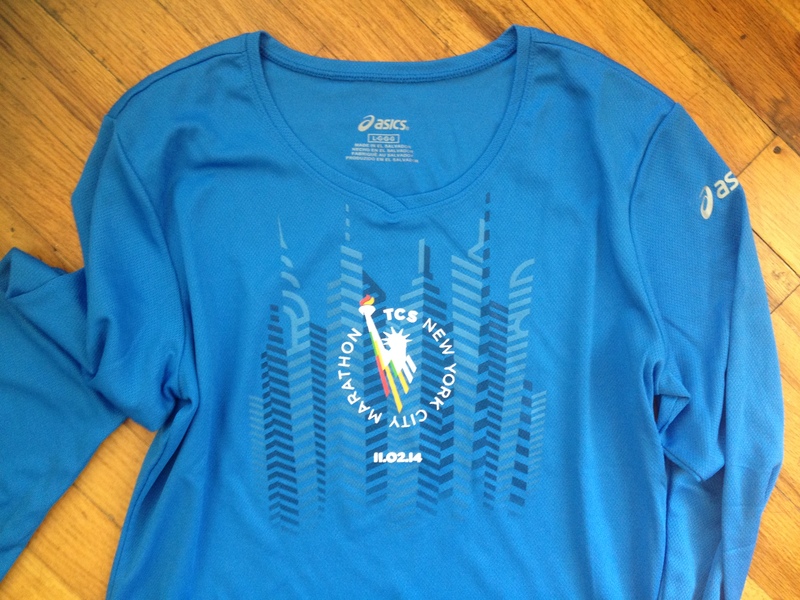 This entry was posted in Running and tagged New York City Marathon by lkewing313. Bookmark the permalink.